Lewis Hamilton may have already clinched a fifth F1 world drivers’ title, but there is still plenty to play for at this weekend’s Brazilian Grand Prix at Interlagos. Hamilton finished fourth in Mexico to make his lead over faltering Ferrari ace Sebastian Vettel unassailable. The constructors’ championship though is not quite yet over, although Mercedes do own a commanding 55-point lead over Ferrari with just two races remaining. Here is a guide to all you need to now about the upcoming weekend at Interlagos in Sao Paulo – including details of how to watch the race on TV and the latest betting odds. What time does the Brazilian Grand Prix start? Where does the Brazilian Grand Prix take place? Where can I watch the Brazilian Grand Prix on TV? 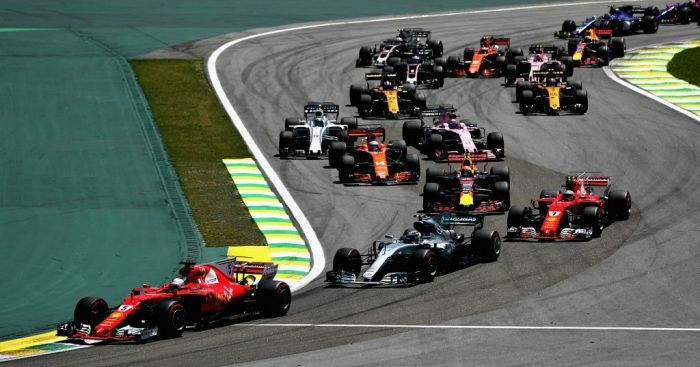 Brazilian Grand Prix weekend – including the race proper – will be screened live in the UK by pay-TV broadcaster Sky Sports on its dedicated Sky Sports F1 channel. Highlights will be aired by free-to-air broadcaster Channel 4. What is the weather forecast for the Brazilian Grand Prix? Friday November 9 21C, mostly cloudy. Saturday November 10: 24C, chance of scattered thunderstorms. Sunday November 11: 27C, mostly sunny. Which drivers have won the Brazilian Grand Prix? Alain Prost is the most successful driver ever in the Brazilian Grand Prix with six successes, while once-mighty McLaren is the most successful constructor with 12 victories. Of the current grid Sebastian Vettel leads the way with three victories while Lewis Hamilton has just the one success back in 2016. What are the odds for the Brazilian Grand Prix? Sebastian Vettel is the slight favourite to win the Brazilian Grand Prix according to major British bookmaker Bet365. F1 tyre manufacturer Pirelli will bring three compounds to Interlagos – the white medium tyre, the yellow soft tyre and the red supersoft tyre.